In the future, food production will be based on connected and standardized production modules communicating with each other. Together they form the CUBES Circle. Besides population growth and climate change, urban growth is one of the largest challenges in the 21st century. Spatial and infrastructural borders between urban centers and rural areas disappear. Agricultural production needs to feed an ever-growing population. At the same time, current innovations in animal breeding and plant cultivation, as well as measures for increasing productivity are not able to compensate for the ever increasing scarcity of cultivation areas. Our vision of agricultural systems of the future is based on the idea that food will be produced in connected, mutually communicating and standardized production units, the so-called CUBES. Those CUBES are the basis for a closed food production system, which overcomes the weaknesses of earlier agricultural production systems by using ISO-standards, stackable units and a bio-cybernetic regulation approach. At the same time, the system integrates easily into the urban future. Due to its mobile nature, adaptability to a changing environment and an inherent scalability, the CUBES can be implemented in urban, rural and even desertified sites. Principles of closed cultivation methods will be integrated into a new process chain and the individual elements of the chain are intelligently connected and regulated. Thereby, synergies like the „Triple Zero®" concept can be used, enabling a production without additives and avoiding emissions and waste. The history of humanity and its cultivation systems show how urgent rethinking conventional food production is. Hominidae populate the earth – a gathering society. Climate cools down, the environment is changing. The forest disappears and humans start hunting – Invention of tools and food processing. Climate is stabilizing and humans settle – Development of farming practices and stock breeding. World population increases rapidly. During the Neolithic Age, tools for plowing are used for the first time. Productivity increases. Living conditions deteriorate, hunger and pandemics spread. In 1798, Thomas Malthus describes a catastrophic scenario for further population growth. Albrecht Daniel Thaer develops ideas for rational agricultural production – Science to fight the food crisis. Agriculture enters the university. The industrial revolution leads to an increase in production and urbanization – living conditions in cities deteriorate – climate change begins. Temperature of Earth is rising. Knowledge leads to the Green Revolution – Hybrids, plant nutrition, increasing harvests and qualities. World's populations increases rapidly, monocultures dominate cultivation - hunger becomes concentrated, the distribution of resources is highly unequal. Adipositas is a global problem - hidden hunger of much higher importance. Climate change and environmental degradation – reduced arable land - reduced biodiversity due to monocultures and hybrids, application of broadband insecticides and pesticides. BMBF call for proposals: Agricultural Systems of the Future – Back to nature or high-tech approach? CUBES Circle finds it's place in the market – sustainable and socially accepted. CUBES Circle is further adapted to local needs and exported worldwide. We believe that agricultural systems of the future must enable a sustainable, resource efficient and flexible production. A shift in basic technologies, as known from the industrial revolution (e.g. mobilization of fossil fuels), is not to be expected in the near future. Thus, agricultural progress cannot be based on revolutionary ideas alone, but will be generated by the diffusion of known technologies into the agricultural sector, with incremental adaptations and improvements. 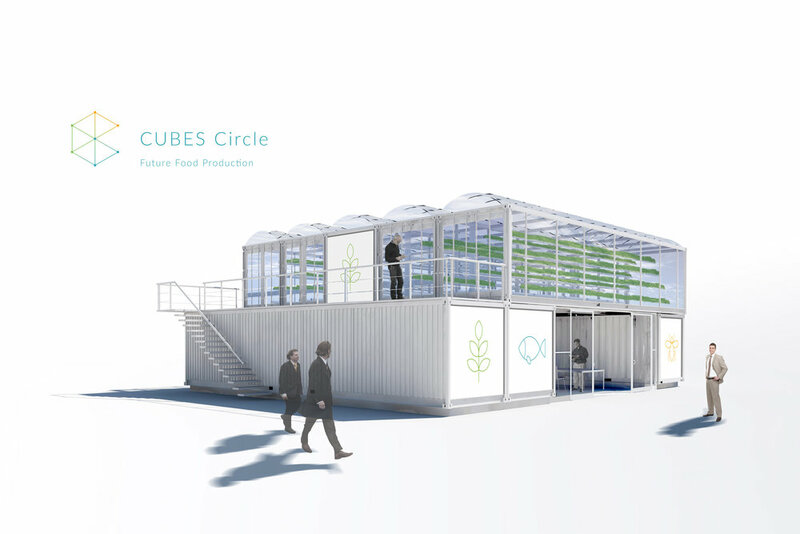 The agricultural system CUBES Circle combines both: newest technology as well as a consequent further development of established production methods and the consideration of sustainability criteria. A closed food production system will be established, that overcomes the weaknesses of earlier agricultural production systems and that integrates easily into the urban future. CUBES Circle is an interdisciplinary team of researchers and industrial partners with different professional backgrounds. Our common aim is to develop an innovative agricultural system for future production of high-value food. This agricultural system will not only be integrated into societal structures, but will also use synergies with established systems like urban settlements. A proposition for the success of such a production system is that it accepted by society and that it complies with sustainability criteria. CUBES Circle is supported by the research and innovation network FoodBerlin.